Dennis Torzeski, known as “Ski,” is a nationally recognized painter, landscape designer, and fine instrument builder. Torzeski was born in Bismarck, North Dakota, in 1945, and began sketching at an early age. His family moved to Frazee, Minnesota, and then to San Diego, California, where Ski currently resides. 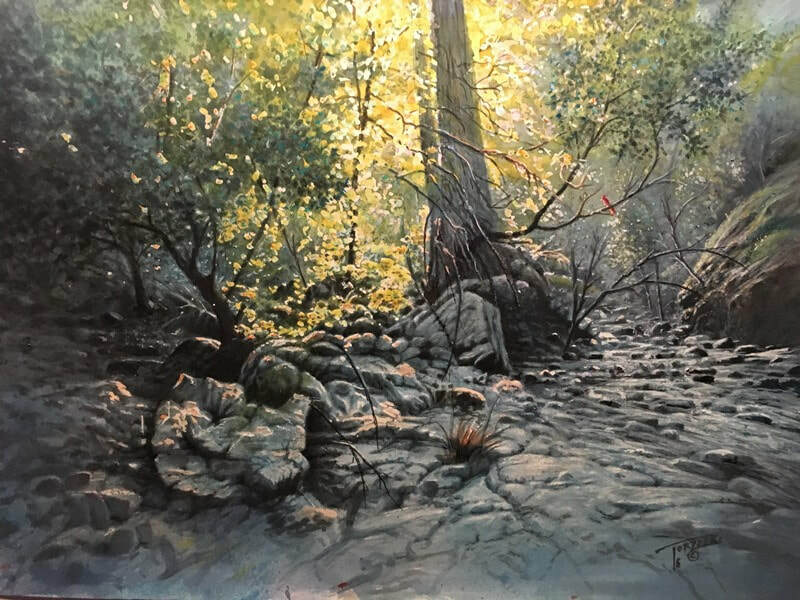 An avid traveler, Torzeski draws his inspiration from the unique landscapes he encounters around the world, from Indonesia, China, Singapore, and Malaysia to Japan, Canada, and the former Soviet Union. 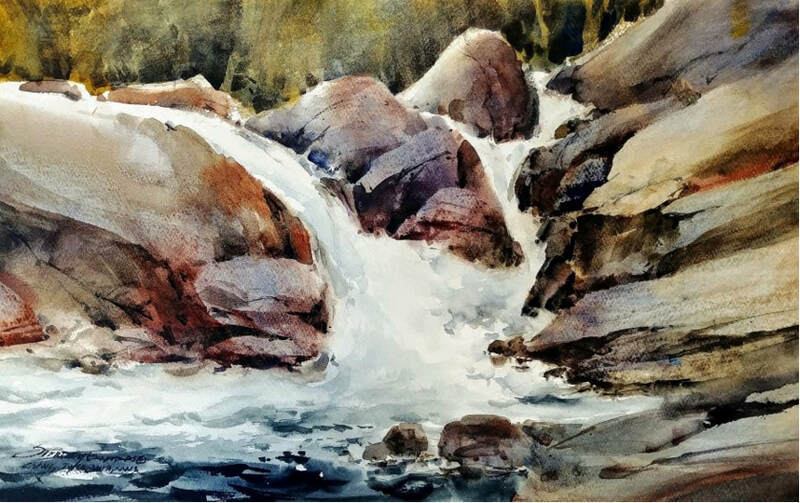 His paintings also pay homage to the natural grandeur of America’s national parks and the rugged terrain of the border states near Mexico, one of the last true frontiers in the world with its visually stunning, untouched countryside. His paintings have been exhibited in the Smithsonian Institution, the UCLA Hammer Museum, and the Otis Art Institute of Los Angeles, as well as in private and corporate collections worldwide. 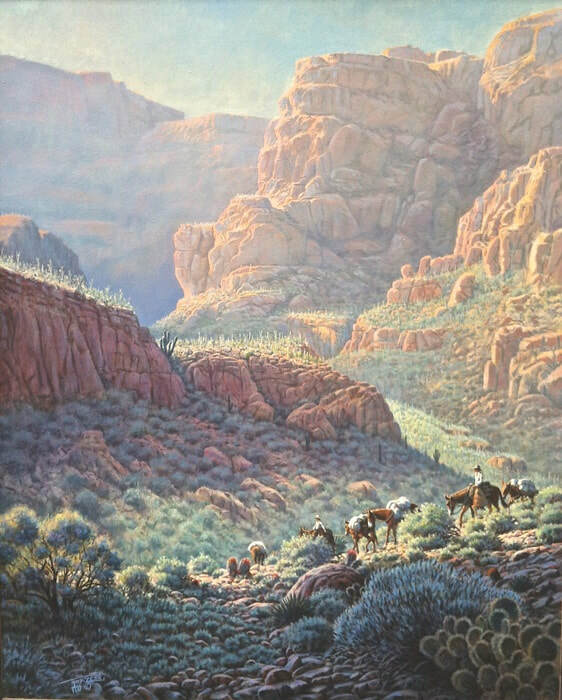 His work has also been featured in magazines such as Southwest Art, television programs such as Inside San Diego and Sun Up, in the San Diego Natural History Museum’s Dos Aguilas/Two Eagles international festival, and in art programming for United States International University (now Alliant International University) in San Diego. As a landscape designer, Torzeski brings together his love of art, horticulture, nature, and architecture to create indoor/outdoor environments. Since first opening his home studio for tours and garden art shows in 1989, his vibrant, hands-on approach to landscape design has been in high demand as he continues to create lush, tropical waterfall gardens for homes throughout San Diego. After winning a national architectural award from the NCMA Association for his dynamic garden designs, Torzeski went on to design and built the 150-foot MacPherson Waterfalls at the Quail Botanical Gardens in Encinitas, California, and the Meadowbrook Koi Pond at the Los Angeles Arboretum. But no artist can rest for long without further challenging his creativity and artistic vision. Already nationally recognized as a painter and landscape designer, Torzeski took a new turn and delved into luthiery, the art of fine instrument making. When musician friends worked with him on a landscaping project, Ski heard them talking every day about what they didn’t like about their acoustic guitars. Drawing on 40 years of woodworking and creating functional and aesthetic art for a living, he decided to build a better guitar. With the blessing of Bob Taylor of Taylor Guitars, Torzeski began working with Taylor's top guitar builder, Tim Luranc, who taught him the acoustics, engineering, and specialized math that are essential to fine luthiery. Always a quick study, Torzeski completed his first prototype two months later. Today, George Benson, Ricky Skaggs [identify who he is: from Boz Skaggs? ], Christian singer Dennis Agajanian, and numerous other fine musicians play his handcrafted instruments.